1. Finance contribution of $6,000 for new and demonstrator MY16, MY17 & MY18 Land Rover Range Rover Sport stock vehicles. 2. Finance contribution of $10,000 for new and demonstrator MY16, MY17 & MY18 Land Rover Range Rover stock vehicles, to approved personal applicants of Land Rover Financial Services (LRFS)**. A lump sum agreed at the time of the loan (“balloon”) may be owed to LRFS** at the end of the loan after all monthly repayments have been made. Finance contribution will be credited to your loan amount by LRFS** after application approval. Vehicles sold by 28/02/2019. Customer delivery by 31/03/2019. Finance applications received by 28/02/2019 and approved by 31/03/2019. Offer ends 28/02/2019. Excludes other offers. While stock lasts. Standard fees/charges and further conditions apply, available from LRFS**. LRFS** may withdraw or change this offer. Dealer may charge an administration fee to arrange finance, ask dealer for information. **LRFS is a trading name of Volkswagen Financial Services Australia Pty Limited ABN 20 097 071 460, Australian Credit Licence Number 389344. 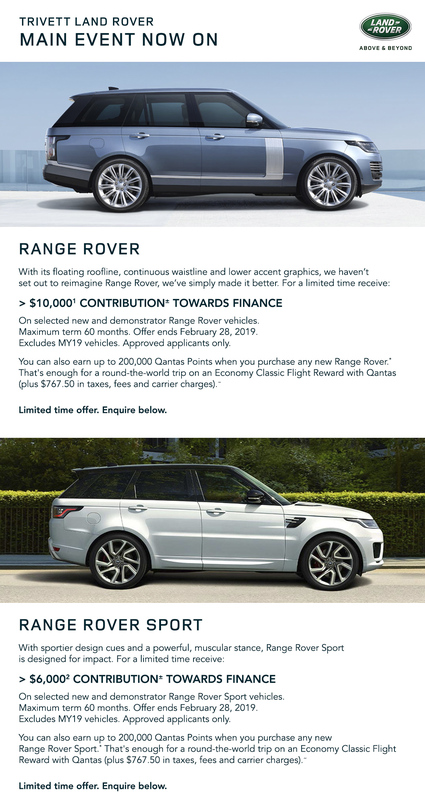 *Qantas Frequent Flyer and Qantas Business Rewards members will earn Qantas Points on new eligible Land Rover vehicles purchased from authorised Australian Retailers. Eligible vehicles exclude used and demonstrator vehicles, any Government or Fleet sales, all on road costs, dealer delivery charges, applicable taxes, vehicle service costs and add-ons such as accessories, branded goods and factory fitted options. Please refer to the Land Rover points earn table for the number of points that can be earned by vehicle model. Qantas Points will be credited to a member's Qantas Frequent Flyer account up to 60 days after the vehicle warranty start date. Qantas Points are earned in accordance with Land Rover TERMS AND CONDITIONS. ~ Classic Flight Reward seats are subject to capacity controls, availability is limited and some flights may not have any Classic Flight Rewards available. Taxes, fees and carrier charges are payable in addition to the Qantas Points required. A Qantas Classic Flight Reward from Sydney to Tokyo (Haneda) with Qantas, onto London (Heathrow) with Japan Airlines, onto Helsinki with British Airways, onto Madrid with Finnair, onto New York (JFK) with Iberia, onto San Francisco with American Airlines and returning to Sydney with Qantas in Economy for 1 adult can be redeemed for 140,000 Qantas Points plus $767.50 in taxes, fees and carrier charges, accurate as at 31 August 2018 but subject to change. Status Credits and Qantas Points will not be earned on Classic Flight Rewards. For more information about Classic Flight Rewards, VISIT HERE.